IKEA, the world's leading home furnishings retailer, officially plugged-in an expanded solar energy system atop its Denver-area store that opened more than two years ago in Centennial, CO.
CONSHOHOCKEN, Pa., Jan. 23 /CSRwire/ - IKEA, the world’s leading home furnishings retailer, today officially plugged-in an expanded solar energy system atop its Denver-area store that opened more than two years ago in Centennial, CO. Installation of the additional panels began this summer, and since then have more than doubled the size of the original array, which already was the state’s largest single-use rooftop array on a commercial building and now is the largest of any use. The 83,700-square-foot solar addition consists of a 623-kW system, built with 2,492 panels, and will produce 961,000 kWh of electricity annually for the store. 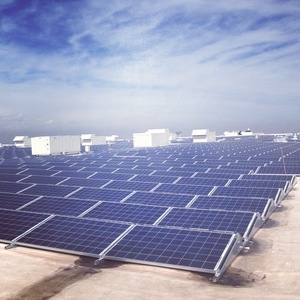 Including the existing system, IKEA Centennial’s total 1,121-kW solar installation of 4,704 panels now will generate 1,701,000 kWh of clean electricity yearly, the equivalent of reducing 1,200 tons of carbon dioxide (CO2), eliminating the emissions of 250 cars or powering 180 homes (calculating clean energy equivalents at www.epa.gov/cleanenergy/energy-resources/calculator.html). For the development, design and installation of the Centennial store’s customized solar power system, IKEA contracted with REC Solar, Inc., a national leader in solar electric system design and installation with more than 10,000 systems built across the U.S.
Last Spring, IKEA achieved its goal of completing solar installations atop nearly 90 percent of its U.S. buildings (39 out of 44 locations), with a generation goal of 38 MW. IKEA owns and operates each of its solar PV energy systems – as opposed to a solar lease or PPA (power purchase agreement) – and globally has allocated $1.8 billion to invest in renewable energy through 2015. This investment reinforces the company’s long-term commitment to sustainability and confidence in photovoltaic (PV) technology. Consistent with the IKEA goal of being energy independent by 2020, IKEA has installed more than 300,000 solar panels on buildings across the world and owns/operates approximately 137 wind turbines in Europe. IKEA, drawing from its Swedish heritage and respect of nature, believes it can be a good business while doing good business and aims to minimize impacts on the environment. Globally, IKEA evaluates locations regularly for conservation opportunities, integrates innovative materials into product design, works to maintain sustainable resources, and flat-packs goods for efficient distribution. Specific U.S. sustainable efforts include: recycling waste material; incorporating energy-efficient HVAC and lighting systems, recycled construction materials, skylights in warehouse areas, and water-conserving restrooms. Operationally, IKEA eliminated plastic bags from the check-out process, phased-out the sale of incandescent bulbs, facilitates recycling of customers’ compact fluorescent bulbs, and by 2016 will sell only L.E.D. IKEA also is installing electric vehicle charging stations at 17 stores in the U.S. Located on 13.5 acres along Interstate 25, north of County Line Road, the 415,000-square-foot IKEA Centennial opened July 2011 as the first U.S. IKEA store with a geothermal heating and cooling system. In addition to 10,000 exclusively designed items, IKEA Centennial presents 50 different room-settings, three model home interiors, a supervised children’s play area, and a 550-seat restaurant. Other family-friendly features include a ‘Children’s IKEA’ area in the showroom, baby-care rooms, play areas throughout the store, and preferred parking. With geothermal and doubled solar, the store mostly will be utilizing its own renewable energy. Since its 1943 founding in Sweden, IKEA has offered home furnishings of good design and function at low prices so the majority of people can afford them. There are currently more than 340 IKEA stores in 43 countries, including 38 in the U.S. IKEA incorporates sustainability into day-to-day business and supports initiatives that benefit children and the environment. For more information, see IKEA-USA.com, @DesignByIKEA or IKEAUSA on facebook, youtube.com/IKEAUSA, instagram.com and pinterest.